The Survival Motor Neuron (SMN) protein is essential for survival of all animal cells. SMN harbors a nucleic acid-binding domain and plays an important role in RNA metabolism. However, the RNA-binding property of SMN is poorly understood. Here we employ iterative in vitro selection and chemical structure probing to identify sequence and structural motif(s) critical for RNA–SMN interactions. Our results reveal that motifs that drive RNA–SMN interactions are diverse and suggest that tight RNA–SMN interaction requires presence of multiple contact sites on the RNA molecule. We performed UV crosslinking and immunoprecipitation coupled with high-throughput sequencing (HITS-CLIP) to identify cellular RNA targets of SMN in neuronal SH-SY5Y cells. Results of HITS-CLIP identified a wide variety of targets, including mRNAs coding for ribosome biogenesis and cytoskeleton dynamics. We show critical determinants of ANXA2 mRNA for a direct SMN interaction in vitro. 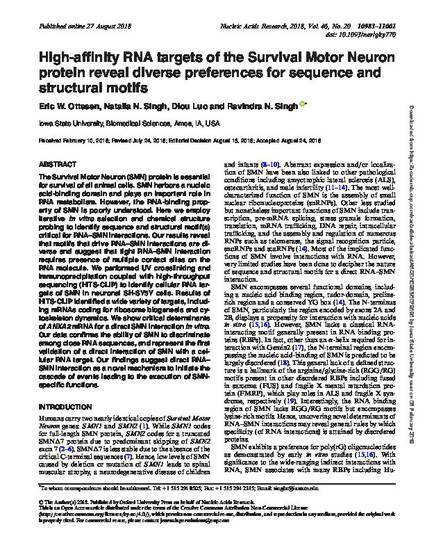 Our data confirms the ability of SMN to discriminate among close RNA sequences, and represent the first validation of a direct interaction of SMN with a cellular RNA target. Our findings suggest direct RNA– SMN interaction as a novel mechanism to initiate the cascade of events leading to the execution of SMN-specific functions. This article is published as Ottesen, Eric W., Natalia N. Singh, Diou Luo, and Ravindra N. Singh. "High-affinity RNA targets of the Survival Motor Neuron protein reveal diverse preferences for sequence and structural motifs." Nucleic Acids Research 46, no. 20 (2018): 10983-11001. DOI: 10.1093/nar/gky770. Posted with permission.